An exponential decay function is an exponential function where the base, b, is in the interval 0 < b < 1. The graph of an exponential decay function decreases when moving from left to right. For example, the function is an exponential decay function since the base, , is between 0 and 1.
â€¢ The graph of the exponential decay function decreases when moving from left to right. â€¢ The graph intersects the y-axis at (0, 1). â€¢ The domain is all real numbers. â€¢ The range is all positive real numbers. â€¢ The graph of is a reflection about the y-axis of the graph y = 2x. â€¢ Both graphs approach, but never quite reach, the x-axis. 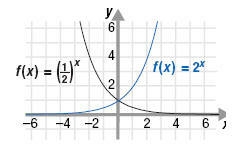 Thus, we say that the x-axis is an asymptote of each graph. This is why the range is (0, +∞) for both functions.